BitConnect Review – Is It a Ponzi Scam? 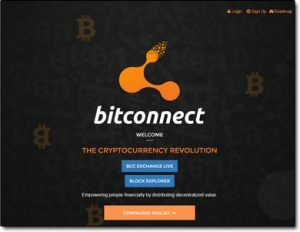 In this review I’m going to be taking a closer look at a company named BitConnect which claims to provide a lucrative investment opportunity for people willing to support their cryptocurrency BitConnectCoin (BCC). The company claims that members investing in their cryptocurrency can expect to see an ROI of up to 40% per month and that members can even earn more money by recruiting more people into the opportunity. At a glance it looks like a classic cryptocurrency Ponzi scheme – so is it actually legit or is BitConnect a scam that’s merely out to part you with your hard earned cash through dodgy cryptocurrency investments? That’s exactly what I’m going to be uncovering right here in this BitConnect review where I’ll be finding out what it’s all about, how it’s supposed to work & whether or not it’s a safe investment – meaning if you’ve been thinking about investing in BitConnectCoin (BCC) then you can rest assured you’ve landed in the right place to find out everything you need to know before you do. As I touched on above BitConnect is a company that claims it can enable people to profit through cryptocurrency investments, but to profit through BitConnect you must invest in their own cryptocurrency named BitConnectCoin (BCC) on which they promise a whopping monthly ROI of up to 40%. If you know anything about cryptocurrency investing then you’ll know that 9 times out of 10 outrageously high ROIs are generally a red flag, especially where there’s recruiting involved (which there is at BitConnect). The other alarming factor about BitConnect is that it seems that their currency BitConnectCoin is completely worthless outside of the opportunity itself as there doesn’t seem to be anywhere that transacts it. And on top of that the website (found at bitconnect.co) doesn’t give out any information whatsoever as to which person(s) or company(s) are behind the operation, with the domain name also being registered privately too. These are sadly all the classic signs of a Ponzi scheme & I can say that confidently because I’ve exposed literally hundreds of them over the years, two of which (DasCoin & Xtreme Coin) were actually cryptocurrency investment websites very similar to BitConnect. The one thing I firstly want to make clear is that there are no products inside of BitConnect therefore the money is made through investment only – no retail sales or anything like that like there is at iCoinPro. BitConnect claim to have one of the most lucrative cryptocurrencies to invest in as they state that their coin increases in value by up to 120% per year as they want to reward people holding the coins in return for helping maintain security of the network (their words, not mine). On top of that BitConnect also provide their own marketplace through which you can buy & sell the currency. To begin you’ll need to trade USD or Bitcoin for the currency but once you have currency you can then sell it via the marketplace if the price later increases. Just remember though that essentially the BitConnectCoin is seemingly worthless outside of the opportunity so personally I’d rather have my money held up in USD or Bitcoin as opposed to BCC. To be able to profit from BitConnect’s affiliate program you must firstly invest in BitConnect yourself, and the more money you invest the more money you will be rewarded through the opportunity. Then on top of that you have the opportunity to earn additional money by bringing new people into the investment opportunity. BitConnect pay out commissions through a uni-level compensation plan. You’ll basically be able to earn commissions from the money invested by the people you refer, the money invested by the people they refer, the people they refer and so on & this continues on infinite levels. As mentioned above you’ll need to personally hold an investment in BitConnect to participate in the opportunity, so whilst it’s classed as a “free opportunity” you’ll actually be required to invest between $100 to $10,000 to get started. You can purchase BitConnectCoins in exchange for USD or Bitcoin. My Verdict – Is BitConnect a Scam? To be honest whilst BitConnect does look very convincing there seems to be a heavy push on recruiting & for that reason I’m leaning towards believing that this opportunity is indeed a Ponzi scheme. The big problem here is that outside of the opportunity the BitConnectCoin seems to be totally worthless as I was unable to find anywhere that you could actually transact it – and in order to participate in the opportunity affiliates are being forced to invest in this seemingly worthless currency which is a red flag if you ask me. It looks to me like the money being paid out to investors is merely the money that’s coming into the company from new investors, and that once new investors stop coming then the money will stop coming too – forcing BitConnect to collapse like many of the other similar crytocurrency opportunities that have come before it such as JetCoin. So overall it’s a thumbs down for BitConnect from me & there’s no way I could recommend this company to you because it simply poses way too much risk to your investment.